Here's how you can complete all the Fortnite Season 8, Week 7 Challenges. It wouldn't be a Thursday without a brand new round of weekly challenges for all Fortnite Battle Royale players. In this Fortnite Week 7 Challenges guide, we'll be going over the latest round of challenges to hit the battle royale game, including how you can complete all of them for the maximum amount of Battle Stars. However if you instead need any additional information on Epic's massive battle royale game, you can always head over to our Fortnite beginner's guide. Aside from finding all the information you need to get started with the game, you can also find a complete list of essential tips and tricks. 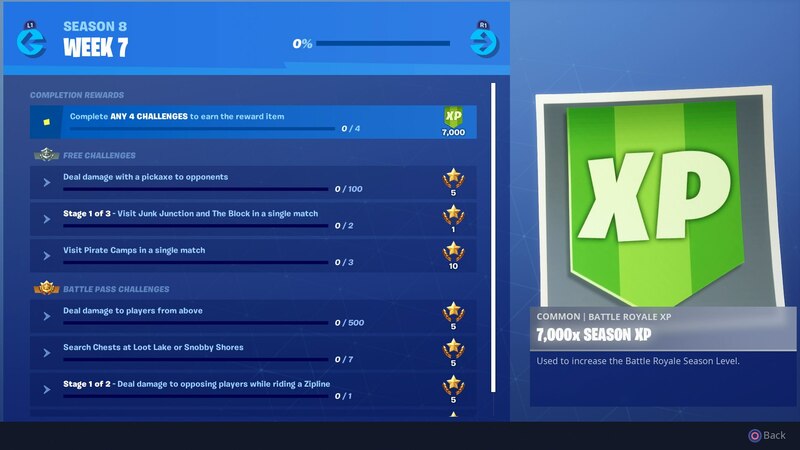 You can see the full list of Week 7 Challenges just below. There aren't too many difficult tasks this week, with the only tricky one perhaps being to visit Junk Junction and The Block in a single match. Deal damage with a pickaxe to opponents (100). Stage 1: Visit Junk Junction and The Block in a single match. Visit Pirate Camps in a single match (3). Deal damage to players from above (500). Search chests at Loot Lake or Snobby Shores (7). Stage 1: Deal damage to opposing players while riding a Zipline (1). Tagged with Action,	Battle Royale,	Co-op,	Epic Games,	Guides,	PC,	PlayStation 4,	Shooters,	Switch,	Xbox One.